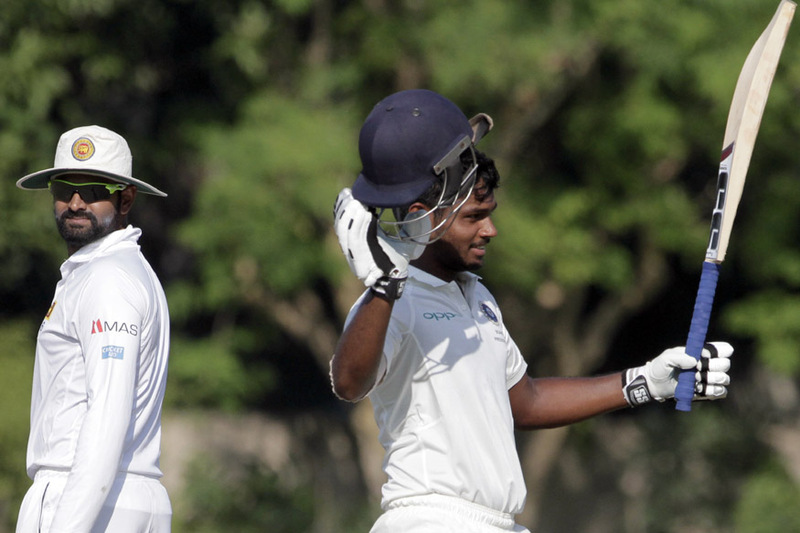 Kolkata, Nov 12: Board President's XI skipper Sanju Samson struck a century to make a strong pitch for a Test call-up as he led his team out of trouble into a tame draw against Sri Lanka in the two-day warm up match here on Sunday. With Samson notching up a 143-ball 128 which included 19 boundaries and a six, Board President's XI reached 287 for five in the last session on day two when the curtains came down on the match following an agreement between the two skippers. Sri Lanka had declared their only innings at 411/6 on the first day. Beginning their essay in the morning, the local side was in a spot of bother, losing opener Tanmay Agarwal (16) and one down batsman Anmolpreet Singh (3) early, with only 31 runs on the board. Sri Lankan pacer Lahiru Gamage (2/41) did the twin damage, trapping Agarwal plumb before the stumps and then seeing the back of Anmolpreet in his next over. The Sri Lankan bowlers then seemed on fire, but Samson walked in and revived the innings by building up three useful partnerships with Jiwanjot Singh (35), Rohan Prem (39) and B. Sandeep (33 not out). The Board President's XI were 89/2 at lunch, but lost Jiwanjot Singh (35) a little later, when he fell victim to offie Dilruwan Perera's guiles. Samson and Jiwanjot added 68 runs for the third wicket. Samson and Rohan Prem (35) then joined hands to stitch together another 71 run stand before Dhananjaya de Silva got Prem out leg before close to tea. The Kerala youngster completed his hundred off 123 balls with a couple, as he and Sandeep took the side past 250. The combination yielded 85 runs. Samson finally fell when he edged a bouncer from Vishwa Fernando and Sadeera Samarawickrama - standing behind the stumps in place of Dickewalal -- made no mistake in accepting the easy offering. Sri Lanka: 411/6 declared (Sadeera Samarawickrama 74, Niroshan Dickwella 73 n.o., Angelo Mathews 54, Dimuth Karunaratne 50; Sandeep Warrier 2/60) vs Board President's XI: 287/5 (Sanju Samson 128; Lahiru Gamage 2/41).